Consider a rice mix which requires you to add 1- 2/3 cups of water and 1 tablespoon of butter to one box of the mixture. These ingredients are all of your reactants. In return, the directions state, it should produce a 2 cups of rice. 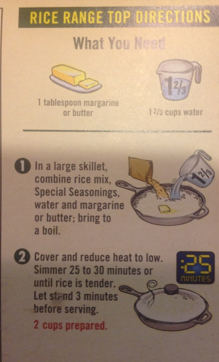 Depending on how much rice you want to make (2 cups, 4 cups, 6 cups, etc), you should vary the amount of ingredients. This is a conversion factor between glucose and oxygen! And for oxygen and water? And for glucose and carbon dioxide? THESE (AND MORE!) ARE ALL CONVERSION FACTORS AND CAN BE USED TO DETERMINE REACTION YIELD. The purpose of these balanced equations is to tell you the proper proportions of reactants and products. You should then determine the correct and appropriate conversion factor for use in the given problem to solve it using dimensional analysis. Fill in the following table to extract the # moles of each reactant and product in the equation. These will be the mole to mole ratios you will use in conversion factor to solve problems. How many moles of H2O can be produced from 3 moles of C6H12O6? How many moles of C6H12O6 are required to react with 8 moles of O2? If you are asked to calculate the yield in mass, you will need to convert the mole values in the table to reflect the mass equivalent to the # of moles! These will be the mole to grams ratios from which you can select to form conversion factor to solve problems. How many grams of H2O can be produced from 4.5 mols of O2? Derive the same table as before, but this time, values of interest will be used for gram to gram ratios from which you can select to form conversion factor to solve problems. How many grams of CO2 can be produced from 400g of C6H12O6? What if you were given more that 1 reactant amount? You would have to calculate the yield using each amount and then report the smallest yield as your result. Why? Because once you run out of one of your reactants, the reaction shuts down and no further product is made. The reactant that limits the amount of product made and is itself consumed in its entirety is called the limiting reagent. So let’s try the same problem as above which gave the grams of C6H12O6 only and add consider that we must also factor in the grams of O2 present during the reaction. How will that change the amount of CO2 formed? How many grams of CO2 can be produced from 400g of C6H12O6 and 160g of O2? So from 160g of O2, 220 grams of CO2 can be produced versus the 587g produced from the 400g of C6H12O6. Which value is true? The smaller one! Why? Because you must report the amount yielded from the limiting reagent which is O2. It produced the lesser amount: 220 g.
Once the 220g of CO2 is produced, the reaction runs out of O2 and therefore stops! So no more product is made, regardless of how much C6H12O6 still remains in excess.